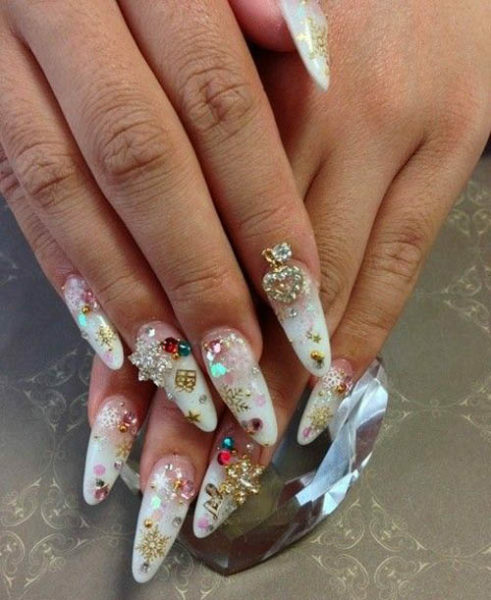 Holiday nail arts are a popular trend these days. When it comes to holidays like Christmas, New Year, or even Easter, it’s a sweet gesture to sport relative nail arts on to the nails signifying the holiday season. 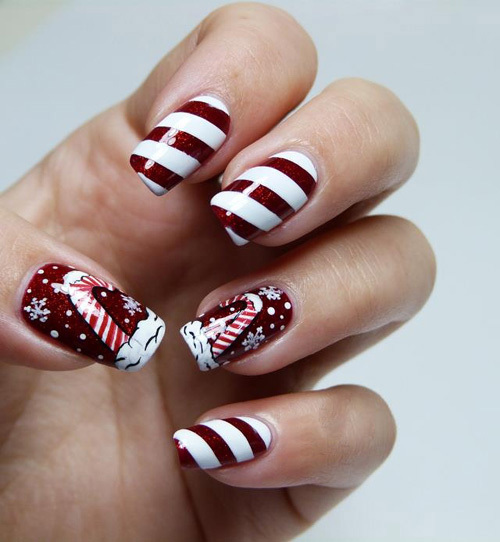 You can give a try to create a few holiday inspired nail art designs like the ones below. 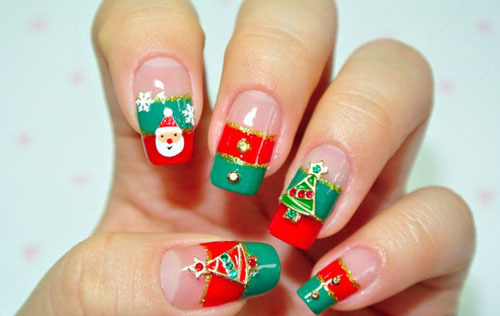 We have hand picked top 9 holiday inspired nail arts which we liked. You can try recreating the same or a bit different nail arts like the ones shown below. Try out a look like the candy canes holiday nail art of the Christmas time. Additionally use some free hand painting or water decals for the candy cane designs and some small decal snowflakes. You can follow up with some tiny dots for the snowy effect. Finish off with a transparent top coat. 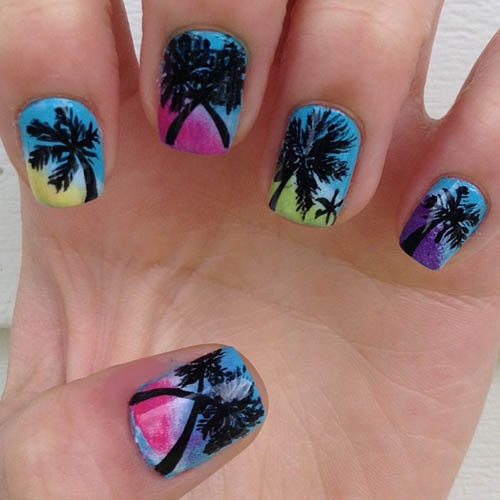 If we are talking about holiday nail arts, then summer holidays will mean the beach, the palm trees and the sunset. Draw up a free hand silhouette sunset scenic nail art like this one. Use gradient style with sponges and colours of your choice for the sunset effect. Use your nail art brush or a black stripper for the palm trees. Finish off with a transparent top coat. 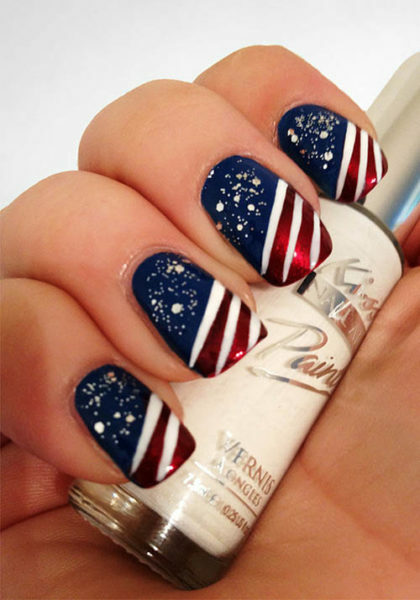 You can try out this easy to do 4th of July nails on your fingers with a nail art brush, a glittery red polish, and some loose glitters. Do not forget the blue at the top. Finish off by drawing lines in white with a white nail art pen or a white striper. Cover the design with a transparent top coat. Good at free hand painting? 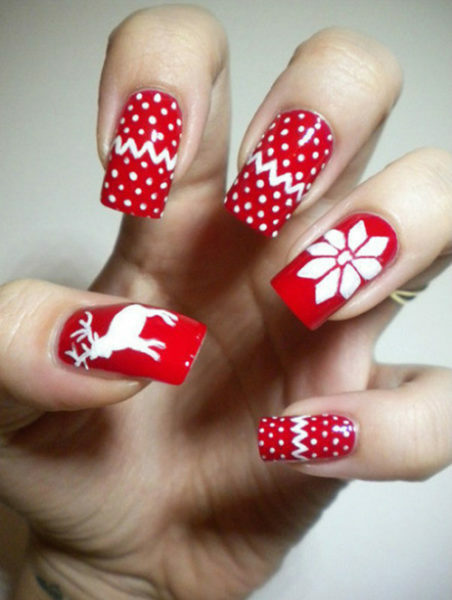 Try out a Christmas design like this one for holiday nail art. Just white and red is all that you will need for colours. Try out a Rhine stone and deco studded Christmas nail like this one. You can get deco nail snowflakes in Rhine stones. This is in fact a French tip design. 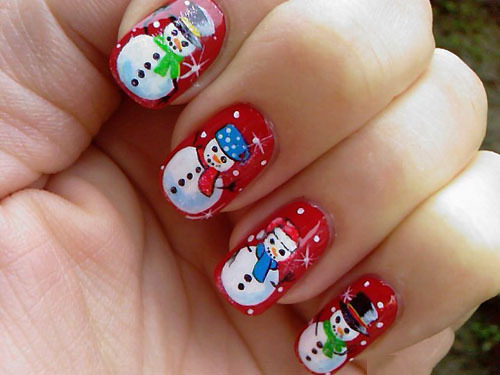 So if you are fond of cool holiday nail art for nails then try out designs like this one. Additionally use some more deco materials like star stickers and rhinestones in other colours Viz. Blue and red. 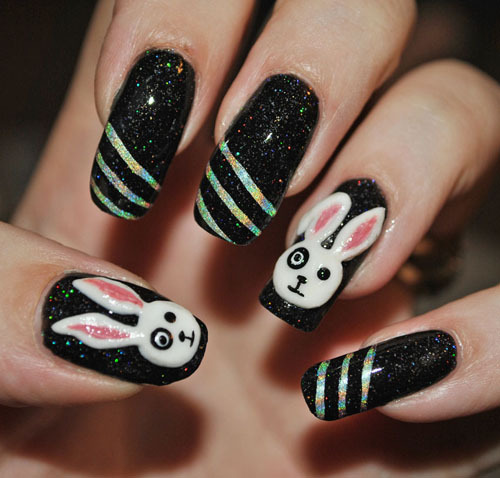 You can create an Easter bunny nail like this one easily with rainbow coloured striping tapes and black polish for the base like shown above. Cover the whole design in hologram glitter polish. 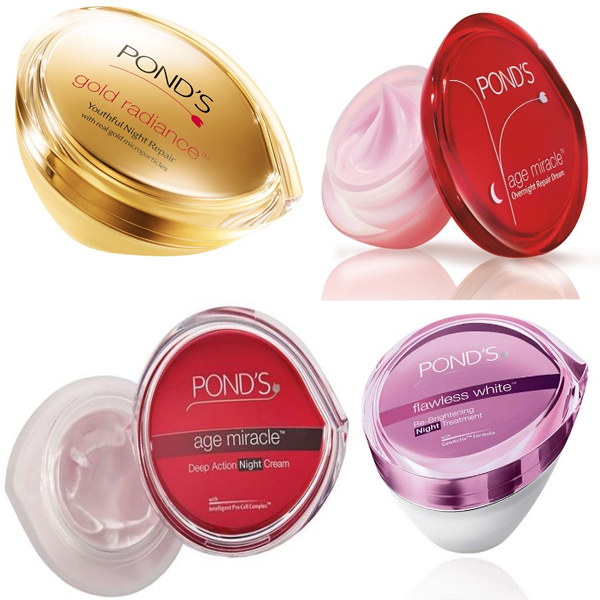 Now use acrylic powder and mixing medium to make a paste of acrylic. Use special acrylic brush to crate the bunny faces. Use pink acrylic powder for the inner of ears of the bunny. Use some black polish with a nail art brush or dotting tool as per your convenience for the eyes, nose and mouth of the bunny. Try it. Try out a snowman nail art like the one above using your dotting tools and nail art brush. Use colours of varying choices for colouring up the snowmen. 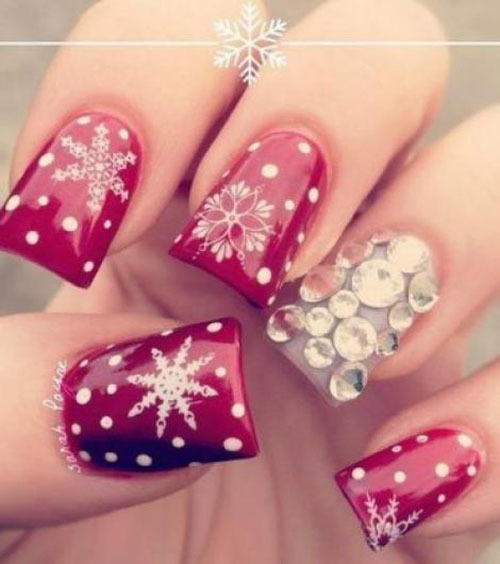 Try out a nail art like this one this Christmas using your favourite red nail polish, a slate finish nail polish for just one finger and some water decal snowflakes for all fingers. Use some dots with a toothpick or dotting tool and cover up the slate coloured nail with big and medium Rhinestones using nail art glue. Cover with a top coat. Awesome right? Try out a nail art like this one for a difference for those normal French tips. You can get some stickers of Christmas style like Christmas trees, Santa Claus, snowman, and the like. If however you cannot get such stickers then you can try free hand painting. Use some sequins too for one nail which will signify buttons of the dress of Santa Claus. Will you try this one? Did you like this post? Which ones are you willing to try out in your coming holiday? 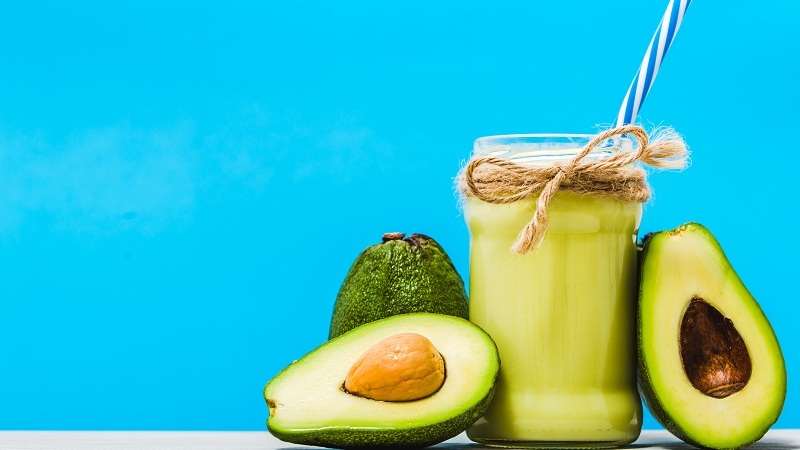 12 Amazing Butter Fruit Juice Benefits With Nutrition Facts !